RALEIGH, N.C.—The NC State College of Education has received a grant totaling $10,863,040 from the John M. Belk Endowment to significantly enhance the support the college provides to community colleges in North Carolina, specifically by developing a pipeline of talented community college leaders who align training programs with labor market demands and improve post-secondary student outcomes. The John M. Belk Endowment’s generous support will also enable the NC State College of Education to launch the Belk Center for Community College Leadership and Research. The grant is the largest ever made to the NC State College of Education since records have been kept and ranks among the Top 20 made to the university since 2010. Because of changing social and economic conditions, the skills a community college president needs today are substantially different than those needed just 10 years ago. To address these challenges, the NC State College of Education has transformed the way it supports the North Carolina Community College System. Over the next decade, North Carolina is expected to add over a half-million jobs, with most of those in occupations requiring training or education beyond high school but not necessarily a four-year degree, according to the N.C. Department of Commerce’s employment projections. With these changing economic conditions, the skills North Carolina’s community college presidents need have evolved. Today’s community college leaders, for example, must ensure access for students, particularly nontraditional and underrepresented students, as well as find better ways to ensure program completion and strong postgraduate outcomes. The $10.8 million grant is the third grant the John M. Belk Endowment has made to the NC State College of Education to support North Carolina’s community colleges since 2015. That year, a $525,000 grant from the Belk Endowment helped the college start the Envisioning Excellence for Community College Leadership program to integrate evidence-based best practices into leadership training programs to help community college leaders improve student success and institutional performance. Further the preparation of future community college presidents. The college partnered with the Aspen Institute’s College Excellence Program — a nonpartisan forum for values-based leadership and the exchange of ideas — to revamp its Doctor of Education (Ed.D.) program in 2015 so it specifically targets aspiring community college presidents and focuses upon developing transformational leaders who have the tools and vision needed to lead community colleges to higher levels of equitable college access and outcomes, learning, program completion, and labor market outcomes. With the grant, the college will integrate into the redesigned doctoral program community college executive leaders as professors of the practice who provide first-hand insights and experiences, field-based leadership opportunities, and examples of how theory and research inform practice. Provide ongoing leadership development to community college executives and trustees. The presidents’ academy will offer programs that help to develop the knowledge and skills of community college presidents throughout the state. NC State will partner with the North Carolina Association of Community College Presidents and North Carolina Community College System as well as Achieving the Dream and the Aspen Institute’s College Excellence Program in these efforts. In addition, the trustees’ institute will develop programs targeted at assisting community college trustees in learning about their role in supporting higher levels of institutional performance. 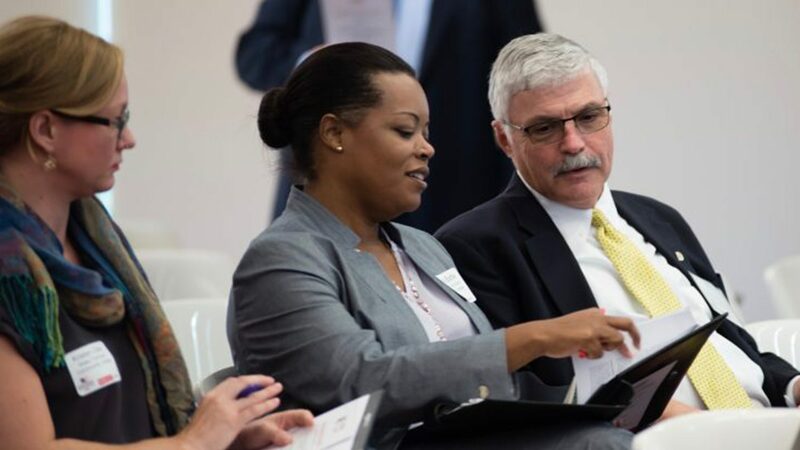 The trustees’ institute will work in collaboration with the North Carolina Association of Community College Trustees and the North Carolina Community College System and provide important support to existing trustee development efforts. Build capacity for evidence-based decision-making and applied research. In partnership with the North Carolina Community College System and other organizations, the college will build an infrastructure to identify the most critical needs facing community colleges, as well as facilitate sustainability and responsiveness to those needs. By conducting and disseminating action research, the college will support community college leaders in making evidenced-based decisions for enhanced institutional performance. The College of Education will be uniquely positioned to address real-world problems in a real-time manner as the land-grant institution committed to the state’s community colleges, as scholars with foundational knowledge in research, and as an educational partner focused on student success. “Our focus will be centered on improving economic outcomes for community college students and the communities where they live,” Jaeger added. The $10.8 million grant provides funding for at least four years. In addition to Jaeger serving as the principal investigator and overseer of the grant, co-principal investigators are James Bartlett, Ph.D., an associate professor; and Reynaldo García, Ph.D., a professor of the practice. 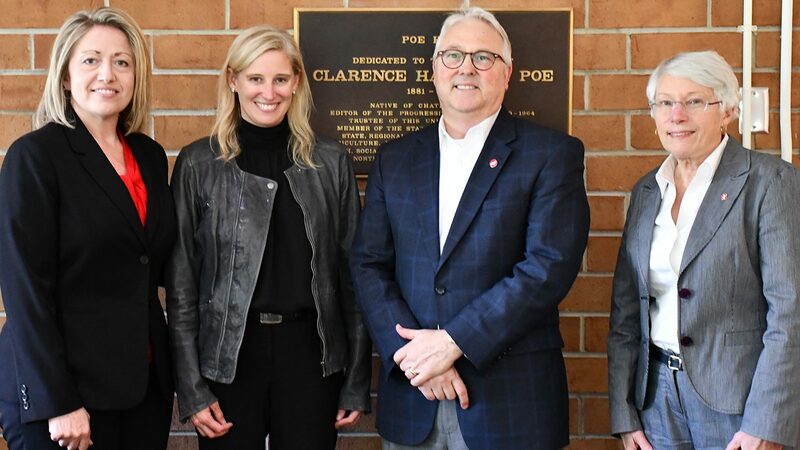 Robert Templin, Ph.D., a professor of practice and a senior fellow with The Aspen Institute, served as a senior advisor on the grant; and Diane Chapman, Ed.D., a teaching professor and director of the Office of Faculty Development at NC State, is the grant evaluator. As the Belk Center for Community College Leadership and Research begins, the grant leaders will draw on the expertise of faculty across the College of Education and NC State, as well as community college leaders across the state and nation. Based in Charlotte, North Carolina, the John M. Belk Endowment is a private family foundation committed to transforming postsecondary educational opportunities to meet North Carolina’s evolving workforce needs. Its mission is aligned with the vision of its founder, the late John M. Belk who served four terms of mayor of Charlotte and was CEO of the department store company Belk, Inc. He created the John M. Belk Endowment in 1995 to fund a national merit scholarship program for his beloved alma mater, Davidson College. Now led by Mr. Belk’s daughter, MC Belk Pilon, the John M. Belk Endowment staff and board continue to partner with innovative, results-oriented programs in North Carolina to further Mr. Belk’s values, legacy, and focus on the value of education as a means to personal fulfillment and community vitality. For more information, please visit http://jmbendowment.org.